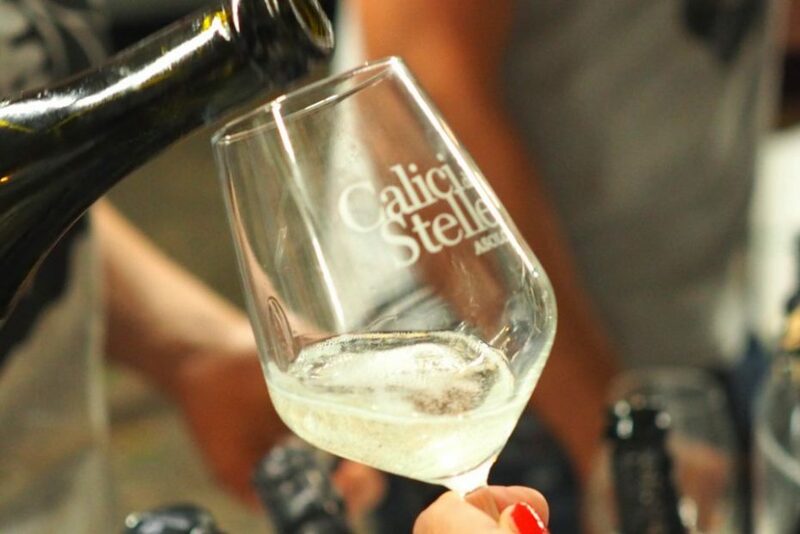 Part 1 introduced the Asolo Prosecco Superiore DOCG, setting it in a cultural context and describing its relationship with the larger Prosecco DOC and the neighbouring Prosecco DOCG of Conegliano-Valdobbiadene. 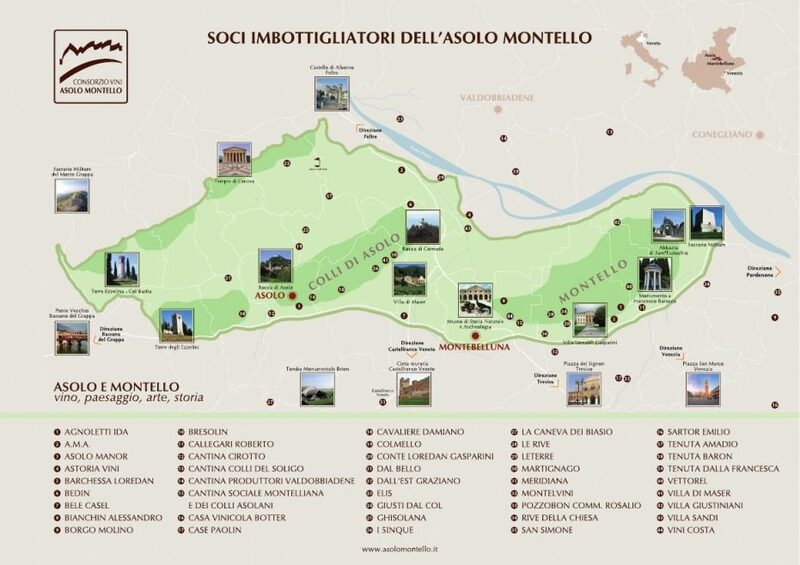 Now Part 2 features a dozen recommendations for Asolo Prosecco Superiore DOCG. In style, these range from bone-dry to sweet, each with food matching ideas mentioned. Most producers make Prosecco in more than one form, so I’ve picked those bottles available in the UK, with prices and sources. All the wines mentioned below are Spumante and made by the Charmat method unless otherwise stated. Spumante is fully sparkling, with pressure between 3.5 and 6 Bar. Frizzante is lightly sparkling with a maximum of 2.5 Bar pressure. The wines are between 11% and 11.5% alcohol. They feature extended second fermentations (called Charmat Lungo) to create smaller and more persistent bubbles with additional leesy flavours. The minimum second fermentation time in a pressure tank for Prosecco is just 30 days, but these take considerably longer. I’ve given the residual sugar (RS) figure too if only to express my inner geek. I’ve also included a re-emerging traditional style called Col Fondo, which is delightfully different, both in creation and taste. 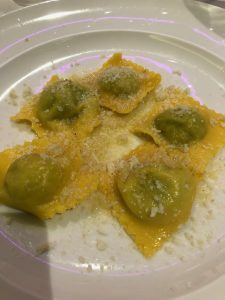 Pasta-wise, Ravioli with lots of butter and parmesan is delicious. Also Fresh-water fish, sushi/sashimi and dim sum. Asparagus, even difficult matches like Artichoke hearts and fresh tomatoes. As an antipasto, try Smoked salmon blinis. Fish & Chips, (or scampi if you want to be posh). Ravioli is great with Extra-Brut. Sea-fish such as sardines and anchovies. Polenta based dishes. Crustaceans (prawns, lobster, crab) Anchovies. Salumi such as Parma Ham. 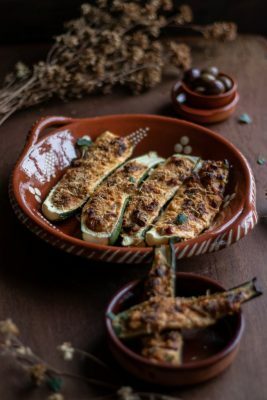 How about this road-tested recipe for Baked Zucchini. This wine is 85% Glera with 15% from the indigenous Blanchetta Trevignana, Perera and Boschera. Full-bodied, the tasting profile adds melon to the expected apple on the palate. A rounded gentle but clean finish. Collina 48 is imported into the UK by Jascots, as the “Adalina” brand. Hence you’ll find this sold exclusively at bars, hotels, and restaurants rather than in retail shops. For example, try the National Theatre or Kew Gardens! Ghisolana is a tiny artisanal organic winery in Monfumo, with just 3 ha of Glera vines over 100 years old. There’s a delicate balance of sugar and acidity, so it’s elegant and clean. Some subtle acacia and wisteria floral notes, with an apple and pear palate, plus a long savoury finish. Most of this is drunk in their excellent restaurant in Monfumo called Al Capitello (their tiny winery is underneath, in the cellar). However, in the UK, 2018 is at the Humble Grape wine bars in London (£19.75). Alternatively, the older 2012 with a honeyed character is £14.46 from Colyer, London. 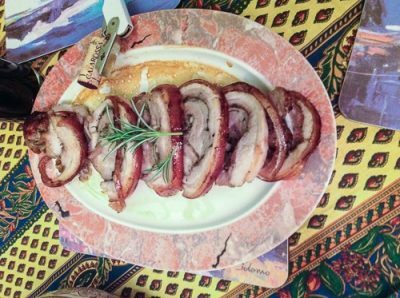 Porchetta (think roast pork with apple sauce), spicier “fusion” cuisine. Stir-fries. 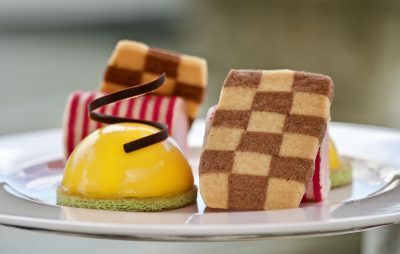 Desserts such as pastries, fruit tarts, ice cream, trifle. Panettone is the classic, other cakes and biscuits. A classic companion for English afternoon tea! But wait! As promised there’s a unique emerging style based on ancient tradition, called Col Fondo. Col Fondo is a different style of Prosecco. It’s only in small volumes, but production is growing as this style rides the trend for “natural wines”. Col Fondo means “with the bottom”. It’s an ancient tradition of having the second fermentation in the bottle. The spent yeast sediment forms a thickish layer at the bottom of the bottle. While some might want to decant the wine from this sediment, that misses the point. A much better solution is to invert the bottle gently two or three times. Those old enough may remember we were once encouraged to do so with Orangina, their TV advert had the slogan, “shake the bottle, wake the drink”. The wine is then served cloudy. Often, these wines also feature other production tweaks like skin maceration, using natural yeasts, extended lees ageing, no fining/filtering and low sulphur. Col Fondo isn’t an “orange wine” and isn’t funky. Instead, they have enhanced flavours and textures, usually Extra-Brut. Consequently, Col Fondo is related to the Ancestrale sparkling method, or the modern “Pet’ Nat”. However, it’s technically neither. Those involve bottling a wine that is still first fermenting. Col Fondo bottles a still wine that has finished the first fermentation, with a dosage of grape must and yeast to begin a new second fermentation in the bottle. It’s a process sometimes known in Italy as Sui Lieviti. Pasta with pumpkin, Spring Rolls. Aperitivi / canapés. White meats such as Chicken. As with all apparently simple things, Asolo Prosecco takes a lot of skill, hard graft and dedication. Not content with making DOCG Prosecco, the Asolo region also produces all sorts of other white and red wines, and I’ll be featuring some of those soon.